Thanks for this great page! Hi all fans well i had an argument with someone if the title "et si tu n'existais pas " was ever performed in English ? I know for fact it was done as in "Y si no existieras"...but was there ever a lyric text in English ? was it ever done by joe or someone else ? advice would be appreciate ? thankx rick. Songs of Joe Dassin recall my distant adolescence. His greatest hits had been played many times on the radio. Still, untill this day I like to listen to them. a catchy, easy melody, but supported by good lyrics. Wonderful times for music, when words flowing from the bottom of heart and not nessecery for money or fame. french lyrics and all the discography. and keep them for next generations. I really liked this web site! Thanks for doing a really good job! Joe is a fantastic, genious singer and musician and he'll always be! I love this site Cool keep it up. thak you, finally all questions are answered CONGRATULATION FOR WONDERFUL JOB.you did. Joe is the best !! Thank you. Finally all questions are answered. Thank you again for the wonderful job you did. Wonderful site. 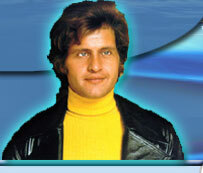 "The best of Joe Dassin" was my first record, back in the early seventies. This site brings back memories. As a German,who lives in Kyoto/Japan I am very glad to listen often to Joes' songs in German language.I love his voice and my favorite song is " Et si tu n'existtais pas. "I wish his soul all the best. I'm a Bangladeshi. Most Bengalis love songs of their own language. As for me, when I was a student in the former USSR knew about Joe. I found that he has a great voice. At that time I did not speak French, but now I learned French in Canada and it was great pleasure to know french language and songs of Joe. I appreciate the people who made this web site and thaks all the folks. Joe, We love you and the funs will remember you. A great page, his music always be alive between us, specially my husband and me. Send from Lima, Peru.